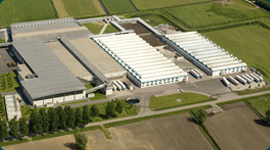 Hooymans Compost B.V. represents the best possible compost. Always of the highest quality, as you wish from your mushrooms. Through a continuous process of research and the most advanced equipment we can fulfill every wish. From nature to nature. There we also go sensibly. As the environment in which we operate. In the weekend of 5 t / m September 7, 2014 fourth Hooymans Compost its 25th anniversary. See the impression this weekend via the link below. and connected partner of the MPF.